(CNN) - With bipartisan support, the House approved the fiscal cliff bill late Tuesday night after Republican leaders ultimately decided not to try and tack on an amendment to the Senate version of the legislation, which passed in the upper chamber around 2 a.m. ET Tuesday morning. The package (PDF) puts off budget cuts for two months and preserves Bush-era income tax cuts for individuals earning less than $400,000 or couples earning less than $450,000. Shortly after the House approved the bill, President Barack Obama delivered a statement at the White House, saying he will sign the legislation. Check back here for the latest updates. 12:06 a.m. ET - Air Force One left for Hawaii with the president on board. 11:30 p.m. ET - Obama will depart the White House late Tuesday, the White House announced, to resume his vacation in Hawaii. He left his family on the island last week, putting his vacation on hold and returning to Washington to deal with the fiscal cliff negotiations. 11:26 p.m. ET - Obama said the government still needs to take a balanced approach on reducing the deficit. "The one thing that I think hopefully in the new year we'll focus on is seeing if we can put a package like this together with a little bit less drama, a little bit less brinksmanship, not scare the heck out of folks quite as much. We can come together as Democrats and Republicans to cut spending and raise revenue in a way that reduces our deficit, protects the middle class and provides ladders into the middle class for everybody who is willing to work hard," he said. 11:24 p.m. ET - “While I will negotiate over many things, I will not have another debate with this Congress over whether or not they should pay the bills that they've already racked up through the laws that they passed,” Obama said, referring to the upcoming debt ceiling debate. 11:21 p.m. ET - "I will sign a law that raises taxes on the wealthiest 2% of Americans while preventing a middle class tax hike that could have sent the economy back into recession and obviously had a severe impact on families all across America," Obama said. 11:20 p.m. ET - In the White House Press Briefing Room, President Barack Obama said the central premise of his campaign for president was to change the tax code that was "too skewed towards the wealthy at the expense of middle class Americans." "Tonight we have done that," he added, thanking the leaders of the House and Senate. He also thanked Vice President Joe Biden, a chief negotiator in the talks. After the commission submitted a report which was received coolly by the president, who did not work to turn its recommendations into law, the two founded the group Fix the Debt. Among other things, the group released a web video in which Simpson performed the “Gangnam style” dance. 11:16 p.m. ET - Calling the deal a "disaster," the national coordinator of Tea Party Patriots lambasted lawmakers for passing the fiscal cliff bill. "Politicians from both parties have an addiction to overspending and they must face it now-not at midnight the day before another so-called “deadline” approaches. We will continue to stand up for fiscal responsibility – even if we are the last ones standing," Jenny Beth Martin said in a statement. 11:12 p.m. ET - From CNN's Dan Merica: Rep. Paul Ryan, the House Budget Committee chairman who voted yes on the fiscal cliff deal, told reporters he cast his vote because, "If you want a bill to pass, you should vote for it." Why did you want it to pass, he was asked. "I am not afraid of anything, I think it needed to pass." Because? "Because it needed to pass. I wanted to stop a big tax increase," he said. 11:08 p.m. ET – House Budget Committee Chairman Paul Ryan, the 2012 GOP vice presidential candidate, voted for the fiscal cliff deal, as did House Speaker John Boehner. The No. 2 ranking Republican in the House, Majority Leader Eric Cantor, third-ranking Republican in the House, GOP Whip Kevin McCarthy, both voted against it. 11:04 p.m. ET - The White House announced President Barack Obama will deliver a statement at 11:20 p.m. ET. 10:57 p.m. ET - The U.S. House of Representatives approves fiscal cliff deal, surpassing the 217 votes needed for passage. The final breakdown is 257 in support and 167 in opposition. The Bush tax cuts lapsed at midnight last night. Every R voting for Senate bill is cutting taxes and keeping his/her pledge. 10:49 p.m. ET - Republican Rep. Tim Huelskamp of Kansas says he will vote "no" on the bill. Headed to the floor. Will vote no. It's time for solutions, not another last-minute deal that increases taxes, spending. 10:48 p.m. ET - Republican Rep. Jason Chaffetz of Utah says he voted against the bill. 10:47 p.m. 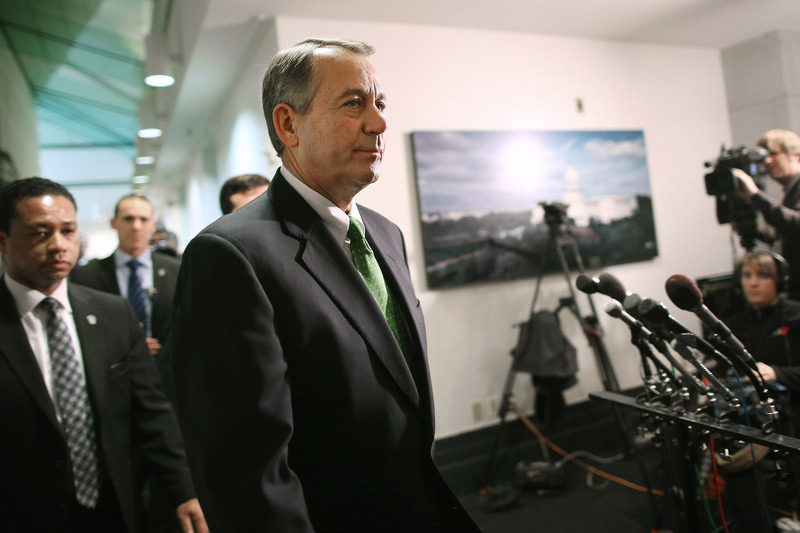 ET - Breaking tradition, House Speaker John Boehner voted on the bill. 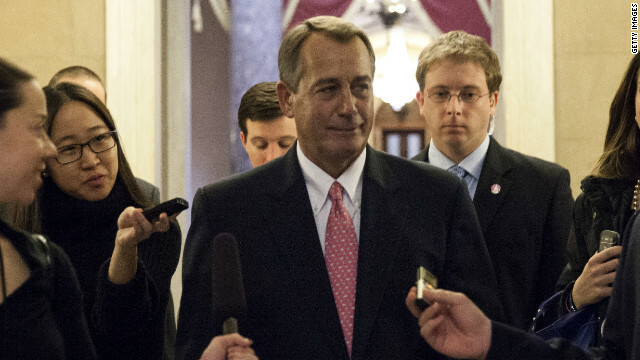 Boehner votes aye for #fiscalcliff deal. 10:41 p.m. ET - House now begins a 15-minute vote on final passage of fiscal cliff deal. 10:38 p.m. ET - Republican Rep. Dave Camp says the permanent extension of the Bush-era tax cuts for households making less than $450,000 is "the largest tax cut in the history of the country." 10:27 p.m. ET - House Democratic Whip Steny Hoyer on the House floor said the bill isn't perfect–"I severely regret that this is not a big, bold and balanced plan"–but urged its passage, nonetheless. "Compromise is not the art of perfection. By its very definition, comprise contains elements that neither side likes. But it also contains pieces both sides can embrace," he said. House Armed Services Chair Buck McKeon, major critic of impact of sequester, says he supports fiscal deal w/"important reservations"
10:16 p.m. ET - Democratic Rep. Allyson Schwartz of Pennsylvania praised the bill in the House floor debate. "As we close out this Congress, we've reached resolution on a major issue facing this Congress and our nation: fair tax policy for our families and our businesses. There's more work to do and in the next Congress, my guess is that it will be just as difficult to reach bipartisan solutions." The Senate passed a $60.4 billion relief package for the states, including New Jersey, impacted by the late October storm last week. If the House does not act before Thursday, the measure would need to be brought through the Senate again in the new Congress. The sequester portion of the fiscal cliff – the across-the-board spending cuts – was a creation of Congress and spelled out in the 2011 Budget Control Act. 10:07 p.m. ET - On the House floor, Republican Rep. Louie Gohmert of Texas thanks Democrats for "finally recognizing that 98% of Americans were helped by the Bush tax cuts." The fiscal cliff bill will extend the Bush-era tax breaks for households making under $450,000 per year and individuals making under $400,000 per year. 10:03 p.m. ET - House Democratic Leader Nancy Pelosi urges her colleagues to pass the bill with bipartisan support and vote "aye." 10:02 p.m. ET - From CNN's Dan Merica: A confident Rep. Steve Israel reflected on the Democrats' caucus with Vice President Joe Biden earlier in the day, stating that Biden swayed wavering Democrats and put the legislation "over the top." "He was able to answer point by point these criticisms. I think he put this over the top. At the end of the day, Vice President Biden put this over the top by convincing Democrats that we needed to display some compromise and some solutions." 9:54 p.m. ET - Republican Rep. Darrell Issa of California says he "cannot bring himself" to vote for the legislation, saying it lacks enough spending cuts. "Because of what we're not doing, I cannot believe that this tax cut will be followed with the spending cuts" necessary to pay down the deficit, he said. 9:50 p.m. ET - Democratic Rep. Sandy Levin of Michigan, ranking member of House Ways and Means Committee, says the fiscal cliff legislation "breaks the iron barrier that has far too long" protected wealthy Americans from higher tax rates. "I urge its passage. This bill sets the important precedent in terms of additional revenue," he said. "The time is urgent, the time is now. We support this legislation." 9:46 p.m. ET - Republican Rep. Dave Camp of Michigan, chairman of House Ways and Means Committee, opens up hour-long debate on the Senate bill. 9:40 p.m. ET - House votes by a wide margin on rule to move to fiscal cliff bill. Final vote count: 396 in favor, 9 opposed. Next they’ll hold debate on the bill itself then vote on its passage. 9:34 p.m. ET - Were he in Congress, Grover Norquist says he would be voting with President Barack Obama and Democratic National Committee Chairwoman Debbie Wasserman Shultz. The keeper of the anti-tax pledge explains why. His assessment of the bill frees Republicans to vote for the measure without concern that his group, Americans for Tax Reform, will invest in their defeat next election. 9:30 p.m. ET - Democratic Rep. Steve Israel on CNN: "This day has been like a New Year's Day, television marathon of the Congress of chronic chaos with roller coasters and twists and turns and fancy footwork and high drama. It's unnecessary. The American people deserve compromise. They deserve pragmatism." While he disagrees with parts of the bill, Israel said he plans on voting in favor of the legislation. 9:25 p.m. ET - Republican Rep. Steve Southerland of Florida says he plans to vote against the clean Senate bill. Later tonight I'm voting NO on fiscal cliff compromise. Raising taxes while doing nothing to address spending makes a bad situation worse. 9:19 p.m. ET - The House is now voting on rule for the fiscal cliff deal, then will start general debate. 9:13 p.m. ET - Rep David Schweikert , R-Arizona, explains he will vote against the Senate-passed deal because of the spending included in it. The measure includes an extension of unemployment benefits, among other spending. He also referenced the Congressional Budget Office analysis of the deal, which was released this afternoon. 8:56 p.m ET - Republican aides say a final vote on the bill in the House will happen roughly between 11:15 p.m. and 11:45 p.m. ET. 8:55 p.m. ET - Democratic Rep. Louise Slaughter, ranking member of the House Rules Committee, said the fiscal cliff deal is "no great victory" and "only a partial answer" that sets the nation up for "another fiscal showdown" in months. However, she said it helps the country avoid "the worst of the fiscal cliff." "This legislation is far from perfect and the process that has led us here was an utter disgrace, yet in this time and crisis we must act first and foremost to protect the economy," she said. 8:46 p.m.ET - Republican Rep. David Dreier, House Rules Committee Chair, on the House floor says deadlines are a "fact of life" and argues that debates running up to the last minute are hardly unprecedented. "What we're doing tonight...will bring us back from the edge of the fiscal cliff," he said, adding that he hopes the clean bill will pass with "strong bipartisan support." 8:41 p.m. ET - House is back in session to debate rule on the Senate fiscal cliff bill. 8:37 p.m. ET - CNNMoney reports on the international markets as they open for business Wednesday while U.S. lawmakers race to complete legislation to avoid the fiscal cliff. Read more. 8:02 p.m. ET - The House will vote Tuesday night on a Senate bill - an up or down vote without amendments - to avert the fiscal cliff, a senior House GOP leadership aide told CNN Senior Congressional Correspondent Dana Bash. 7:58 p.m. ET - While CNN reports there's a growing sense that the House will take up the Senate bill without amendments, Republican Rep. David Schweikert of Arizona said he won't support the Senate bill unless the House adds a provision calling for more spending cuts. "I'm going to vote no, I'm absolutely going to vote no," he told CNN's Ali Velshi. Schweikert said he's disappointed in the lack of spending cuts from the Senate bill, saying it contradicts Democratic language that called for a balanced approach involving both cuts and revenue. "Part of this actually breaks my heart because I was struggling to find a way to get to yes," he added. While other Republican lawmakers are saying it's time to address the fiscal cliff now and tackle spending cuts later, Schweikert said he couldn't support kicking the can farther down the road. "This is probably what 2013 looks like. We're going to have the debt ceiling, the continuing resolutions. This is what our future looks like because the issue before us is about debt and spending," he said. "This is our reality and you've just seen in what just happened tonight how hard it is to have that conversation." After talking to multiple conservative House GOP lawmakers, it appears the sentiment is growing to simply vote up or down on the Senate bill – and not amend it. House GOP leaders warn they are still officially gauging support among members for an amendment that would add $300 billion in spending cuts. However the biggest concern among even conservatives who will vote against the Senate bill is that the Senate won't take up an amended bill and it would backfire. 7:36 p.m. ET - CNN's Dana Bash says there's a growing feeling on Capitol Hill that the House will hold a vote on the Senate bill without adding any amendments. Her reporting confirms what Reps. Tom Cole and Tim Murphy told CNN below. 7:35 p.m. ET - Republican Rep. Tom Cole, who's the deputy GOP whip in the House, said he expects the chamber to pass a clean version of the Senate fiscal cliff bill Tuesday night. "I do think we're going to do the right thing tonight," Cole said on CNN, referring to holding a vote on the Senate bill without amendments. The Oklahoma Republican said he didn't want to take the risk of sending a bill back to the Senate, only to see it die. "Let's take the Senate deal and fight another day," he said, adding there will be more opportunities to battle for more spending cuts in the near future. "There's lots of leverage on the spending fights to come." Cole was one of the first Republican lawmakers to call for a compromise on the tax hike provision, saying in November that Congress should pass legislation dealing with tax increases now, then address spending cuts later. 7:30 p.m. ET - Republican Rep. Tim Murphy of Pennsylvania said he's not confident GOP leaders can get the 217 votes needed to add an amendment to the Senate bill that would add $300 billion in spending cuts. "I'm not sure those votes are going to be there," he said on CNN. In that case, the House would take up the Senate bill tonight as it now stands. Murphy said such action would likely result in passage of the Senate bill. 7:20 p.m. ET - The House is back in recess subject to the call of chair. Republican leaders are presumably figuring out if they have the 217 votes needed to add an amendment to the Senate bill. The amendment would add another $300 billion in spending cuts. 7:02 p.m. ET - CNN's Deirdre Walsh reports the amendment Republicans would add to the fiscal cliff bill includes $300 billion in spending cuts but keeps Senate language on postponing the sequester for two months. 6:49 p.m. - From CNN Senior Congressional Producer Ted Barrett on Capitol Hill: Emerging from a GOP conference meeting, the conservative Louisiana lawmaker said there is a growing "sentiment" among GOP lawmakers to allow the Senate passed-bill to be approved in the House because the consequences are too great at this point not to have a bill pass. "I think the sentiment is that if we really tried to improve, what really is a bad bill, it probably would just frustrate many people so we may just let it go as it is," he said. Asked what changed so quickly from the last GOP meeting just a few hours ago, he said, "it's one of those things where an idea pops up that sounds good. But then you think through and you look at all the ramifications and problems. I think for many of us we look back at the payroll tax thing that happened a year ago and see that when you see a bill pass with so many Republicans in the Senate, it would probably have a similar result." He said he expects the bill to pass later Tuesday or Wednesday morning largely on Democratic votes. He will vote against it. Fleming said he does not expect it to hurt Boehner politically nor threaten his speakership. "Why should it?" he asked. "I think we're together and on the same page now more than we have been for a long time." 6:45 p.m. ET - Congressmen on both sides of the fiscal cliff weighed in on Twitter as Republicans met to discuss their next steps: Either vote for the Senate version of the bill as it now stands or attempt to add amendments and send it back to the upper chamber. @SpeakerBoehner The American people need their leaders to act responsibly to avert the #FiscalCliff. No time for political games. I cannot support the bill the US Senate sent over early this a.m. Meaningful budget cuts and spending must be addressed moving forward. House #GOP must hold an up or down vote on Senate passed #fiscalcliff deal & must hold it now. The American people deserve a vote. 6:37 p.m. ET - The House is now making votes on matters unrelated to the fiscal cliff. 6:36 p.m. ET - CNN Radio Congressional Correspondent Lisa Desjardins takes us into the Capitol in this podcast, detailing the sights and sounds where the dealmakers were working. 6:32 p.m. ET - "If we see an amended version on the floor, this deal is dead," Ryan Lizza, CNN Contributor and Washington correspondent for the New Yorker, said on CNN. 6:22 p.m. ET - CNN's Dana Bash reports a vote is likely to happen in the House Tuesday night. Read more about the two options they may vote on. 6:18 p.m. ET - The House is going into session in 15 minutes to vote on other measures, Republican Rep. Steve LaTourette said on CNN. They'll use that time to get a count on who would favor adding amendments to the Senate bill (217 votes are needed) or hold a vote on the bill as it now stands. The current version of the Senate bill has a better shot of passing than a Senate bill with GOP amendments, he said. "We've been beaten in this fight," he added, saying he would vote in favor of the Senate bill–without amendments–if it came to an up or down vote. 6:15 p.m. ET - CNN's Dana Bash reports House Speaker John Boehner presented Republican members two options in their meeting tonight, according to a Republican source. The first would be to make an amendment to the Senate bill that would add a package of spending cuts. House GOP Whip Kevin McCarthy will do a whip check on this spending cuts amendment after the meeting. If they can get the commitment of 218 votes on this amendment, they will bring it to the floor and send it to the Senate. The speaker and House Majority Leader Eric Cantor both cautioned members about the risk in such a strategy, the source said. They told them there is no guarantee the Senate would act on it. If they cannot get the commitment of 218 votes tonight, they will bring up the Senate-passed measure for an up-or-down vote in the House. 6:11 p.m. ET - How did we get to the edge of the fiscal cliff in the first place? CNN's Ali Velshi explains the path that led to the situation. 6:09 p.m. ET - The White House is watching movement on Capitol Hill "very, very closely" tonight, CNN's Jessica Yellin reports on "The Situation Room." 6:08 p.m. ET - CNNMoney reports that the rich would see a much bigger tax bill under the fiscal cliff deal that passed the Senate early Tuesday morning, but even they would get some nice breaks. Those making a million and up would pay $122,560 more in federal taxes, on average, according to new estimates by the Tax Policy Center. That means this group, which includes those bringing home many millions of dollars, would see a 5.7% drop in after-tax income. Read more. 5:53 p.m. ET - The Senate has adjourned for the night and will reconvene Wednesday at noon. 5:42 p.m. ET - CNN's Gut Check takes a look at senators who voted "no" on the last-minute bill. 5:31 p.m. ET - The majority of Americans believe failure to reach a solution to the fiscal cliff would be a crisis or major problem. Two in ten said crisis and 50% said major problems in the latest CNN/ORC poll, conducted December 17-18. Only 24% say it would mean minor problems and 4% say no problems will result from going off of the cliff. Sampling error is plus or minus 4% points. 5:25 p.m. ET - CNN's Dana Bash reports House Speaker John Boehner and House Majority Leader Eric Cantor are on their way to the GOP meeting. 5:17 p.m. ET - Democratic Rep. Debbie Wasserman Schultz says if there's no vote in the House on Tuesday or if Republicans push to add amendments to the Senate bill, then "it means we're going over the cliff." She noted the Senate has already adjourned and the new Congress starts again on Thursday, meaning negotiations would be back at square one. "If that's what Republicans wants, it's a little baffling," she said on CNN's "The Situation Room with Wolf Blitzer." 4:49 p.m. ET - Vice President Joe Biden briefly commented on the prospects for the deal he negotiated with Senate Republican Leader Mitch McConnell after stopping for a sandwich. He was questioned by CNN's Lesa Jansen. 4:50 p.m. ET - From CNN's Dana Bash and Deirdre Walsh: A GOP source says all House Republicans are meeting again –at 5:15 p.m. ET. 4:46 p.m. ET - House GOP members expressed sharp discontent Tuesday over the Senate bill, saying the measure lacks spending cuts and adds to the federal debt. "I know the president won his election but I also won my election," Rep. Spencer Bachus of Alabama told reporters on Capitol Hill. "If we are going to increase taxes, we need to cut spending and this package doesn't do that." Meanwhile, Rep. John Fleming of Louisiana said the bill raises "taxes to give the president more money to spend. We think that's a bad idea." Others discredited the Senate bill based on the chamber's late-hour voting time of 2 a.m. ET. "I know it was way past those senators' bedtime and they were bleary eyed when they were reading it, so we are trying to fill in the gaps where they may have missed a few things," said Rep. Jack Kingston of Georgia. VP Biden at DC Potbelly- I asked him we we avoid fiscal cliff- he says "I think so, I hope so"
4:11 p.m. ET - Vice President Joe Biden told reporters outside the White House that he thinks and hopes the fiscal cliff deal will pass the House. He returned to the White House after lunch at a sandwich shop nearby. 4:09 p.m. ET - More from Issa: "Let's remember: If we get it right on January 2, 3, 4, 5, we will not see the [fiscal cliff] kick in." Wolf Blitzer asks Issa about potential backlash from voters. "They'll hate you," Blitzer says. "I only have one voting card," Issa says. "I was instructed by my constituents to vote on conscience." 4:05 p.m. ET - Rep. Darrell Issa, R-California, says on CNN he's with Eric Cantor: He cannot vote for the fiscal cliff bill in its current form. He wants a bill with spending cuts. 3:50 p.m. ET - The fiscal cliff deal passed by the Senate Tuesday morning would increase deficits over the next decade by close to $4 trillion, according to the Congressional Budget Office. But that's relative to where deficits would otherwise be if Congress were to let all the Bush tax cuts expire and keep much if not all of the other tax hikes and spending cuts under the fiscal cliff in place. Under that scenario, only $2.88 trillion would be added to the debt over the next decade. 3:36 p.m. ET - Another potential wrinkle to the fiscal cliff battle: the new Congress will be sworn in on Thursday. Any legislation passed by one chamber and not the other will have to be re-voted upon by the House and the Senate when the new session begins. VP biden went out to get lunch at Potbelly sandwhich for self + staff. Mess inside White House is closed, folks are hungry! 3:34 p.m. ET - LaTourette predicts that some kind of measure will be voted upon Tuesday in the House. 3:31 p.m. ET - Rep. Steve LaTourette, R-Ohio, says it's ridiculous for the House to vote on a bill passed by "sleep deprived octogenarians." (He's talking about senators who voted on the bill early this morning). "The Speaker and Leader laid out options to the members and listened to feedback. The lack of spending cuts in the Senate bill was a universal concern amongst members in today’s meeting. Conversations with members will continue throughout the afternoon on the path forward." 3:16 p.m. ET - If Republicans amend the Senate-passed bill to include spending cuts - and vote to pass it - the measure would then head back to the Senate for another vote in the upper chamber. 3:09 p.m. ET - CNN's Deirdre Walsh reports from Capitol Hill that House Majority Leader Eric Cantor opposes the fiscal cliff measure passed by the Senate. "I do not support the bill," Cantor told reporters as he was leaving a meeting of the GOP conference. He said no decisions have been made, and that he's looking for the best path forward. 3:11 p.m. ET - If the House holds an up-or-down vote, will Democrats get enough votes? Democratic Whip Steny Hoyer says he doesn't have a number but believes they "will have a bipartisan vote." Neither he nor Minority Leader Nancy Pelosi would say whether they were conferring with Republicans about which GOP members would support the bill, as they said their own members were still considering the proposal. "Our members are taking a look at the bill," said Democratic Rep. Chris Van Hollen, the top Democrat on the Budget Committee. "We would just ask our Republican colleagues to bear in mind the good of the country as they weigh the equities." 3:03 p.m. ET - Rep. Steny Hoyer, the House Democratic whip, said Democratic members were still reviewing specifics of the compromise measure, but that he was hopeful the House would pass it before this congress adjourns. 3:01 p.m. ET - Rep. Nancy Pelosi, the House Minority Leader, says after meeting with Vice President Biden she expected House Speaker John Boehner to bring the Senate-passed fiscal cliff measure to the floor for an up-or-down vote. "Up until now our speaker has said when the Senate acts we will have a vote in the House. That is what the speaker said. That is what the American people deserve," Pelosi said. 2:31 p.m. ET - Rep. Steve Israel, D-New York, said Vice President Biden was "evangelical" during his meeting with House Democrats Tuesday in order to convince skeptical members to vote for the fiscal cliff bill. Speaking on CNN, Israel said he thought most Democrats would support the measure after hearing from Biden. 2:01 p.m. ET - Rev. Barry Black, Senate chaplain, referred to God as the "source of strength for stressed out emotions and strained minds" in a prayer on the Senate floor. "Thank you for using our senators in the early morning hours of this new year to accomplish your purposes. May the sparks from their bipartisan cooperation ignite flames of unity that will illuminate the inevitable darkness to come," he said. Rep Jeff Flake says he doesn't think House will vote on cliff today, says still looking at the bill, on whether vote 2mrw "it's got to"
2:17 p.m. ET - For even more on the fiscal cliff deal the Senate signed off on last night, read this story from CNN's Josh Levs: 5 things to know about the fiscal cliff. 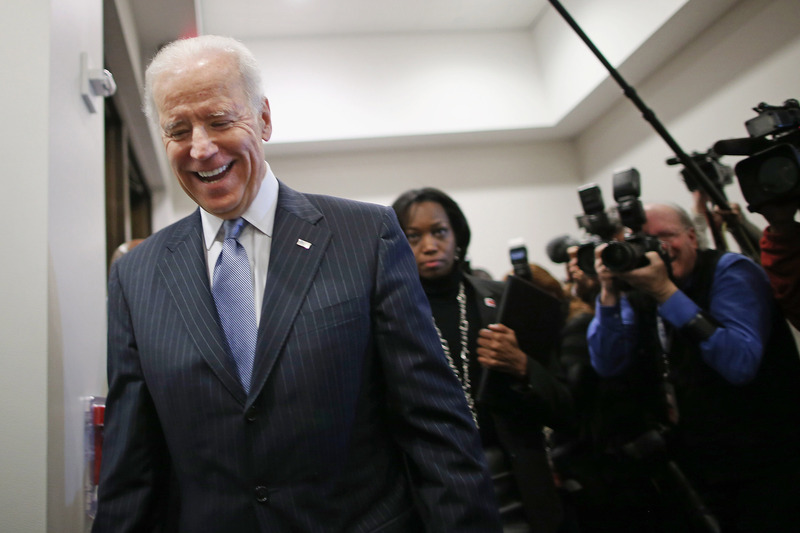 Joe Biden has left the Democratic caucus in the House. 12:32 p.m. ET - CNN's Deirdre Walsh reports Vice President Biden has arrived on Capitol Hill for a meeting with House Democrats. "Hello folks, Happy New Year, Happy New Year," he said as he walked into the meeting. 12:25 p.m. ET - A House GOP leadership aide tells CNN's Dana Bash that any decision about a House vote on the fiscal cliff measure will come after a second GOP meeting later this afternoon (a first meeting is slated for 1 p.m. ET). 12:03 p.m. ET - Rep. Norm Dicks, D-Washington, is on CNN relaying what he heard Tuesday morning during his work-out in the House gym. Dicks says he thinks the measure will come up for a vote, and will pass with support from Democrats and Republicans. Dicks, who is retiring at the end of this congress, is the ranking member of the House Appropriations Committee. 12:01 p.m. ET - Dana Bash live on CNN soon with latest on where the House fiscal cliff vote stands. On cnn next with rep norm dicks to give me scoop about what he heard in the house gym about cliFf votes. 11:59 p.m. ET - Here's a chart mapping how senators voted early Tuesday on the fiscal cliff measure. 10:57 a.m. ET - Rep. Tim Huelskamp, R-Kansas, explains why he thinks he'll be voting against the fiscal cliff deal passed in the Senate last night. 10:45 a.m. ET - Sen. Marco Rubio, R-Florida, released a statement Tuesday explaining his "no" vote on the fiscal cliff bill. He wrote that while he "appreciated" Sen. McConnell's work in negotiating a deal, he couldn't support the arrangement since it "does nothing to bring our dangerous debt under control." "This deal just postpones the inevitable, the need to solve our growing debt crisis and help the 23 million Americans who can't find the work they need," Rubio wrote. For more on which senators voted "no" on the deal, click here. 10:41 a.m. ET - More on the timing of today's action on Capitol Hill from CNN's Deirdre Walsh: Two aides say the GOP conference is meeting today at 1 p.m. ET. Any decision whether the House votes Tuesday will most likely be made following that meeting — after House Speaker John Boehner and Majority Leader Eric Cantor go over the fiscal cliff deal with all House Republicans. BIDEN RETURNS: the Dem-whisperer will be at the House Democrats' caucus meeting here at the Capitol today. 12n ET. 10:25 a.m. ET - More from Dana Bash: House Majority Leader Eric Cantor’s office says there’s no decision yet on whether the House will vote Tuesday on the fiscal cliff deal passed by the Senate. The debt ceiling fight is where we can make major spending changes and prevent the country from becoming Greece. 9:49 a.m. ET - Rep. Dennis Kucinich, D-Ohio, said on CNN's "Newsroom" Tuesday morning that he would likely vote for the fiscal cliff bill which passed the Senate, but that he needs time to consider the "fine print." This would be one of the last votes Kucinich would cast, as he is retiring from the House this year after serving eight terms. 9:45 a.m. ET - Conservative Republican Rep. Jason Chaffetz of Utah wrote on Twitter Tuesday he wouldn't support the bill passed by the Senate. If every Democrat backs the measure, roughly 30 Republicans will need to vote "yes" in order for it to pass the House. Without substantial, real first year cuts in spending I can't vote for the bill passed by the Senate late last night. 9:30 a.m. ET - CNN Senior Congressional Producer Deirdre Walsh reports that House Republicans will meet on the Hill at 1 p.m. ET, ahead of any votes on the fiscal cliff package. 9:28 a.m. ET - What exactly is in the measure up for debate? Most prominently, it would extend the Bush-era tax cuts for the vast majority of Americans and spare tens of millions from the Alternative Minimum Tax. While it would provide some short-term certainty, it would leave a range of big issues unaddressed. Read more at CNNMoney. 9:21 a.m. ET - Rep. Dennis Kucinich, D-Ohio, says on CNN the Senate-passed fiscal cliff bill looks like something he could support, but that he'll have to read the fine print. 8:30 a.m. ET - Rep. Jason Altmire (D-PA) says he will vote for the Senate approved bill unamended, expects most of House to pass it. Thank goodness on Thursday that POS Eric Cantor will no longer be my representative due to redistricting. If Cantor stalls the process President Obama should declare the treaty that ended the Civil War null and void and bomb Virginia. Fortunately this drama marks the beginning of the end of the GOP. Once again Republicans obstruct a simple piece of legislation to protect the middle class and move us to the next step of spending cuts. Cantor should be thrown out of Congress and so should every Republicans who votes against the Senate bill which passed almost unamiously. These tea baggers need to be thrown out in 2014 for betrayal of the nation and of the People. They are unwilling, as usual, to do anything. This has been the most do-nothing, not even present in Washington Congress in history. They have been on recess for the last 15 of 19 weeks of the year. They are the ones who should lose everything – their ridiculous salaries, full healthcare benefits, and lifetime pensions – instead of it hitting the middle class. Republicans are traitors of America and deserve no seat in our democracy designed to do what is best for the PEOPLE not their extremist views. Shame on the Republican Party and on Boehner for NO leadership. well, Cantor is an economic terrorist. he proved that last year. so this is not remotely surprising.